Do you play music in the background while you’re at work? Do you find that it focuses you, or distracts you? Does it energize you, relax you—or annoy you? Depending on who you ask, you’re likely to hear very different answers. There’s a wide body of often conflicting research on this subject, due on one hand to the sheer subjectivity of our musical tastes, and on the other, all the many kinds of work we do. Songs that make a great backdrop for creating a spreadsheet or an expense report might not be suitable for drafting a paper or a PowerPoint. But with deliverables on the line, it’s important to know whether our listening habits are helping or hurting our efficiency. How can we optimize our playlist—or know when silence is best—for better productivity? These science-backed guidelines will help you soundtrack your work for focus and prioritization, whatever your job entails. A new study published in Applied Cognitive Psychology looked at participants’ performance on verbal creativity problems and found that, compared to silence and simulated library noise, background music actually worsened performance. The researchers assess that every kind of music they tested—with lyrics in one’s native language, with lyrics in a foreign language and instrumental—interfered with the participants’ verbal working memory, resulting in “significant” impairment of the creative task. “The findings here challenge the popular view that music enhances creativity,” co-author Neil McLatchie, Ph.D., told ScienceDaily. The best results came from either silence or a low, library-like hum of people in the background. If your work environment is too loud, or if silence is too stark for you, give sounds of nature a try. Now is this a call to cast your morning playlist curation routine aside? Not so fast. 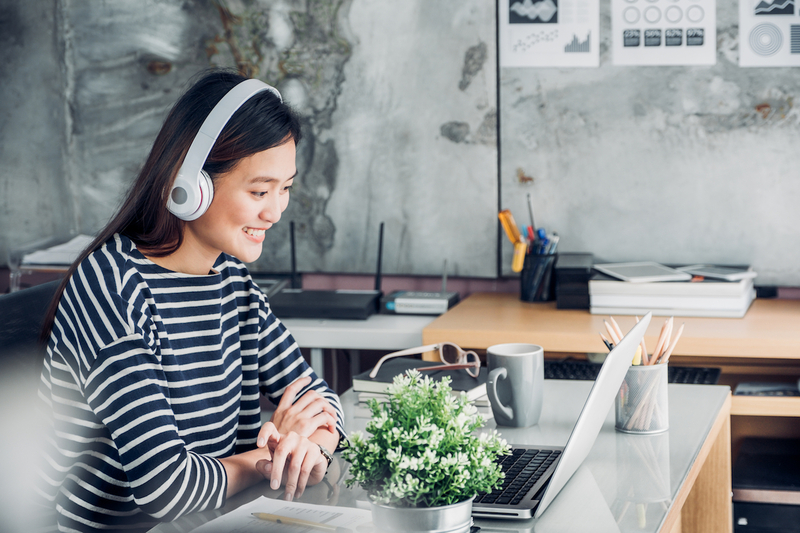 Our personal preferences and work styles have a powerful bearing on how well we deliver on our tasks, so if you find music to be helpful, stick with what you know works for you. Music lovers, take heart: There’s an unexpected upside to these potentially focus-disrupting effects. When we’re distracted we’re thrown off our usual thought patterns, and it can take about 23 minutes for us to find our way back to where we left off. This sort of meandering sounds like a waste of time and probably wouldn’t fly in many offices—but if you’re searching for ideas for a project, this could be exactly the diversion you need. A 2017 study published in PLOS One found that music, especially in major keys (think happy-sounding), promotes divergent thinking, a hallmark of “thinking outside the box.” A 2015 study in Neuropsychologia backs this up, too. So if you’re trying to brainstorm branding ideas in a more free-form setting, being distracted by music might actually help surface connections and insights you otherwise wouldn’t have seen. If you spend all day on spreadsheets, music might actually aid your work. Studies over the years have found music to propel focus and forward momentum on projects involving numbers, software development and other systematic, repetitive tasks. These projects don’t involve verbal working memory, so lyrics are less of a concern here, but the key is for it to feel like an environmental soundscape rather than a focal point. Film and video game soundtracks do this especially well. Whatever your taste, save your favorite jams for your commute home. Hearing music that gives us a strong emotional reaction—whether we love it or can’t stand it—is distracting, according to a 2014 study, also in Applied Cognitive Psychology. A neutral emotional reaction is much less of a mental distraction, so aim for this as your baseline. Music is one of the most powerful mood-boosters we know of, and in particularly tense circumstances, the stress-relieving benefits of listening could outweigh any potential losses you might experience from distraction. If you’re having a rough day, queue up something you love and find soothing—this will help counteract your stress and restore your mood back to a neutral state where you can get stuff done. A recent study in the International Journal of Behavioral Medicine found we can feel this relief after about 20 minutes of listening. For a proven soother, the song Weightless by Marconi Union has been found to alleviate anxiety by up to 65 percent. Mallory Stratton, is an Associate Editor at Thrive Global. She brings to Thrive a multifaceted background spanning science editorial, brand strategy, publishing and partnerships. She was recently Associate Editor on “It’s All In Your Head” by Keith Blanchard, an illustrated brain science book and worked closely on its accompanying cross-platform partnerships with Time Inc. and WebMD.